Tidal power is an ocean based technology with the high potential of providing us with clean and free energy for the future. Tidal power involves taking advantage of the kinetic energy stored in the movement of the incoming and outgoing tides, as well as the daily differences between the high tide and the low tide at a given location. One of the oldest ways used to harness tidal power for the generation of electricity involves building a dam across a suitable bay or estuary that has large differences in elevation between high and low tides. Today there are many tidal power projects around the world using tidal barrages and dams, oscillating hydrofoils, tidal turbines and tidal kites for small scale electricity generation within the shallow and deeper waters around different coastal areas. There are many different types and varieties of renewable energy systems, but tidal power, being an ocean based technology is one of the few sustainable sources that can be accurately predicted over many years as the ebb and flow of the tides rely on the gravitational movement of the sun and moon. As the movement of the tides around a coastline does not occur at the same time, but is staggered around the coast, full tidal power generation will be available at one tidal location when there is no tidal power available at another location around the coastline, thus allowing power generation from multiple locations over a period of time. 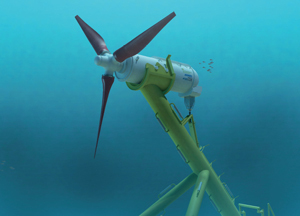 As a marine renewable technology, tidal power generating machines can be located underwater and beneath the waves in under utilised locations. This gives a big advantage over other marine based systems as the tidal turbines can not be seen, unlike off-shore wind farms or wave energy devices. 1. Tidal Range Devices: these take advantage of the potential energy stored between the high and low tide levels. 2. Tidal Stream Devices: these utilise the kinetic energy of moving water in tidal currents to generate electricity. Tidal range devices make use of the vertical difference in the water level between a high tide and a low tide. They do this by trapping or impounding the sea water within a flooded basin behind a large tidal barrage before releasing it back to the sea via turbines. By opening and closing sluice gates, sea water is allowed to enter into the basin or estuary before being trapped on one side creating a static head of water across it due to the cyclic movement of the tides. When the head of sea water is suitably large enough, the sluice gates are re-opened and the impounded water is allowed to flow back to the sea using the force of gravity across horizontal axis turbine blades for electricity generation. By shaping the design of the turbine enclosure, the sea water can be concentrated and accelerated much faster over the turbines blades increasing the efficiency of generation. Tidal range devices can be used in various electrical generation tidal schemes such as: flood generation, ebb generation and two-way electrical energy generation with the type of scheme depending upon the strength of the tide and water requirements. Tidal stream devices are generally designed for deep water operation were it is too deep to mount tidal turbines directly to the seabed. Tidal stream technologies use large turbines to extract the energy from the moving tides and are similar in operation to wind turbines. Like their wind turbine cousins, tidal turbines use axial shaped turbine blades that operate according to the principles of aerodynamic lift. As the dense seawater flows over the turbine blades, it produces a rotational force turning the blades and producing electricity. Although tidal currents tend to be much slower in terms of velocity compared to the wind, the greater density of the seawater compensates for this allowing tidal stream devices to generate similar levels of electrical energy to that of conventional three-bladed wind turbines. Also unlike wind power, there are no sudden or extreme changes in speed of the tidal currents underwater which could potentially damage the tidal stream devices and any storms or severe weather conditions above the surface can not damage the tidal stream devices or force them to shut down. Although tidal stream turbines do not have significant impacts on water levels, unlike tidal range devices with their dams and tidal barrages, they can impact on the surrounding water quality by reducing both the upstream and downstream tidal current velocities due to the extraction of energy allowing for sediment concentrations to build up. This could affect both the erosion and deposition of the sea bed a considerable distance away from the location of the tidal power array. 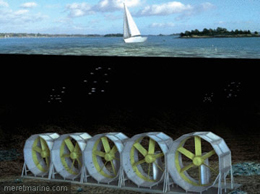 Also large rotating marine energy devices such as tidal turbines can have many other unseen impacts on the surrounding environment such as underwater noise pollution, the generation of electromagnetic fields around the generators and electrical cables as well as the striking of fish and marine animals by the turbines rotor blades or other moving parts. Oscillating hydrofoil devices extract energy from the tidal current in a similar manner to a rotating tidal turbine but oscillate in an up and down motion. 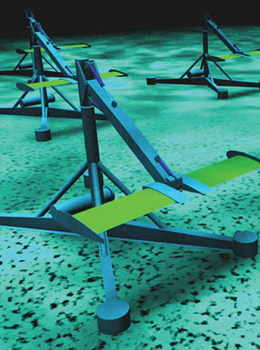 An oscillating hydrofoil developed by the University of Strathclyde, consists of a large hydrofoil wing attached to a long lever arm that is allowed to move up and down. Due to its wing like shape, as the tidal current flows over the hydrofoil wing it generates a vertical lift which causes the attached lever to move upwards. At the peak of the movement, the hydrofoil’s angle of attack relative to the approaching tidal currents changes, so that now the lift is being generated on the underside of the hydrofoil wing. This reverses the direction of motion forcing the wing downwards until moving water over the wing causes it to reverse direction, and the up-down movement continues once again. Thus the total swept area for an oscillating hydrofoil wing will be its vertical up-down distance by its wingspan. The resulting up-down oscillations of the hydrofoil wing is used to drive a high pressure hydraulic pump which in turn drives and electrical generator. The advantage of the oscillating hydrofoil wing is that the single blade can be of a much simpler design than those of a rotating axial turbine, because the speed of the flow of the seawater, and therefore the blades angle of attack, is the same along its entire length and not twisted like the axial turbine blade. Tidal kite devices as its name suggests, works in the same way as a conventional kite, but underwater. A tidal kite consists of a hydrofoil wing tethered to the seabed and which is allowed to “fly” or glide along in the oceans tidal currents. The flow of these tidal currents over the hydrofoil shaped wing creates a lifting force that pushes the kite forwards through the moving water in much the same way as a conventional kite moves through the air. Through a combination of tension in the kites tether and the use of a suitable rudder to aligning itself to the current controlling its direction. The tidal kite can be made to fly through the water along a given trajectory. The mechanical energy of a small turbine attached to the kite is used to drive a generator to produce electrical energy as the kite flies through the seawater. The obvious disadvantage here is what happens when the tidal currents stop flowing on the turn of the tides, does the tidal power kite fall to the seabed. The simple answer is no, as the hydrofoil wing has neutral or slight positive buoyancy meaning it wants to float and fly even if there are no tidal currents. 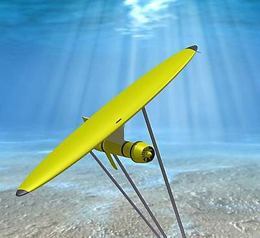 Other such flying tidal power devices include those that resemble underwater aeroplanes with two counter rotating turbines connected to electrical generators, positioned symmetrically either side of fuselage shaped body. The advantage of these types of tidal power technologies is that compared to large undersea turbines, they are relatively cheap to produce, easy to maintain and service, have a relatively low environmental impact, and can be installable almost anywhere, sea or river. Sea Energy could be better for Indonesia (Where I live in my Country). But not implemented agressively. I believe this is very Fiseable and Viable to provide Huge Energy and sustainable. According to the lunar theory of tides, the Earth’s crust at the latitude of Washington, with a frequency of two times a day, rises with an amplitude of about 20 cm, at the equator, the range exceeds half a meter. Then why, the highest tides are formed in the temperate zones and not at the equator? The highest tides on Earth are formed in the Fandi Bay in North America – 18 m, at the mouth of the Severn River in England – 16 m, in the Bay of Mont-Saint-Michel in France – 15 m, in the mouths of the Sea of ​​Okhotsk, Penzhinskaya and Gizhiginskaya – 13 m , at the cape Nerpinsky in the Mezensky Bay – 11 m. The swirling theory of tides explains this inconsistency by the absence of whirlpools at the equator, as well as cyclones and anticyclones. May I use the images on the website for academic purposes?